Emily Dawson was born ca. 1820 in Maryland. She married James Lloyd LeCompte on 16 Apr 1835 at the Baltimore City Station Methodist Episcopal Church. I have been unable to find Emily’s parents and family, despite an intriguing lead that’s been taunting me for decades. Following the death of her husband, James LeCompte, Emily left Baltimore and settled in Talbot county, Maryland for a time. She and her minor children appear there in the 1860 Federal Census and again in an 1863 newspaper column assessing taxes. By 1870, she moved back to Baltimore where she lived until her death in 1890. Why is Talbot county significant? Talbot county is the location of a number of prominent Dawson families. 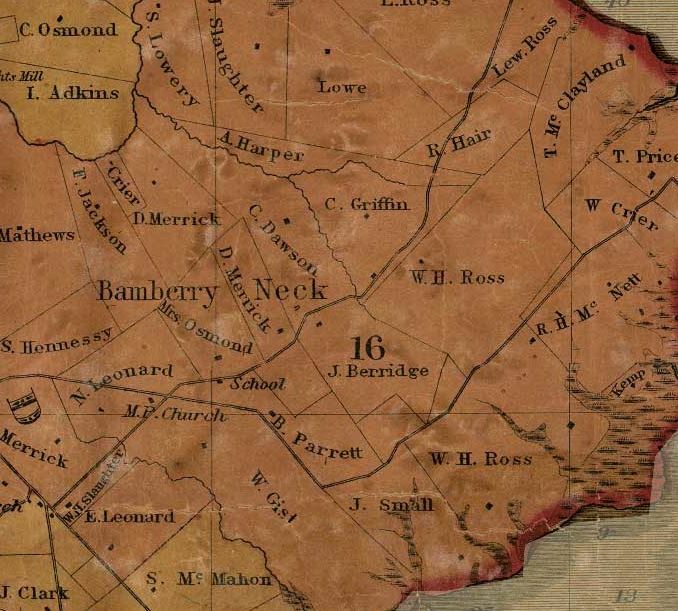 Using the 1860 Census and the William H. Dilworth Map of Talbot County (1858) it’s possible to follow the enumerator’s path as he recorded the families of District 3, Bamberry Neck east of Trappe. A detail of the map is included below, though it only shows wealthy property owners (and those that paid to appear). Notable neighbors of Emily in 1860 were (in order of enumeration): John H. Matthews, Alexander Frampton, [Emily LeCompte], Mary E. McKnett, William Kemp, William Crier, William McClayland, Thomas R. Price, and William H. Ross. The nearest Dawson to this “neighborhood” was C. Dawson, of whom I have no information. It’s also interesting that Emily’s son Lewis’ middle name is Ross, a prominent name in this area. Another interesting tidbit related to the Ross name, is that a Margaret R. Dawson married a Lewis P. Ross on 22 Aug 1833 at First Methodist Episcopal Church in Baltimore. This is the same church where Emily and James married, two years prior. Could this be a sister? If so, why were the Dawson girls going to Baltimore to get married? Similar marriages in the same church in the same period: John and Elizabeth (Richards) Dawson (1826), Henry and Elizabeth (Dawson) Gentt (1832), Ralph and Ann (Graham) Dawson (1835), Joseph and Maria (Dawson) Sanbourn (1841), Samuel and Mary Ann (Dawson ) Bradshaw (1844), and Philip and Mary (Wilson) Dawson (1844).